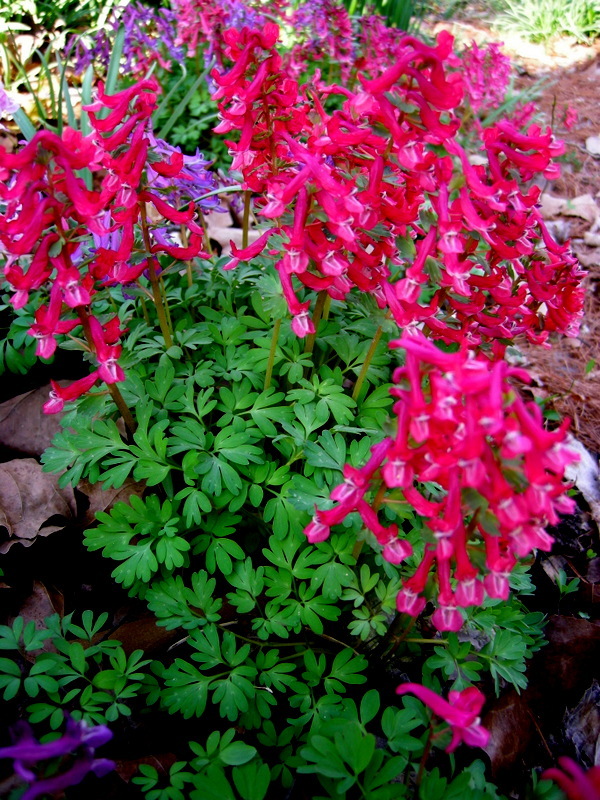 Corydalis solida comes in many colors: in the right corner is ‘Purple Bird’, in the middle is pink ‘Beth Evans’, and in the left corner is brick red ‘George P. Baker’. 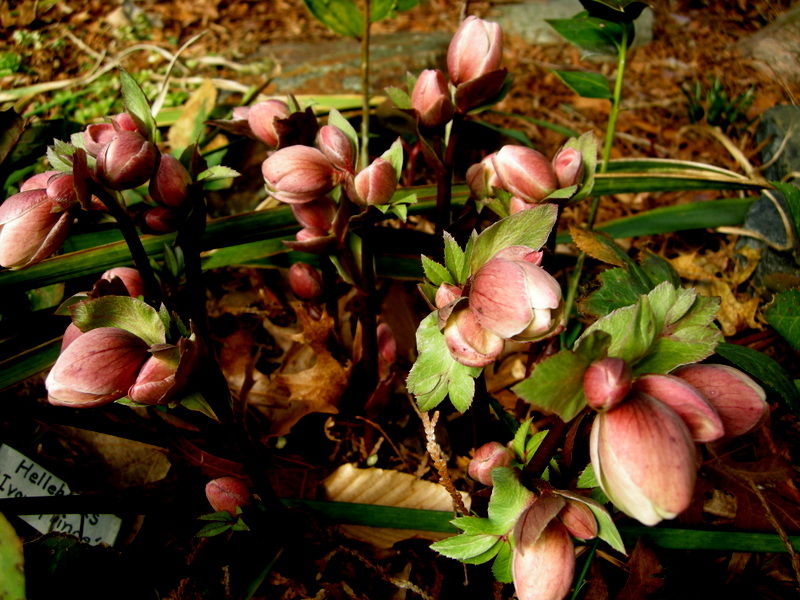 As the hellebores bloom in my garden, they do not stand alone but are surrounded by large swathes of spring ephemerals. 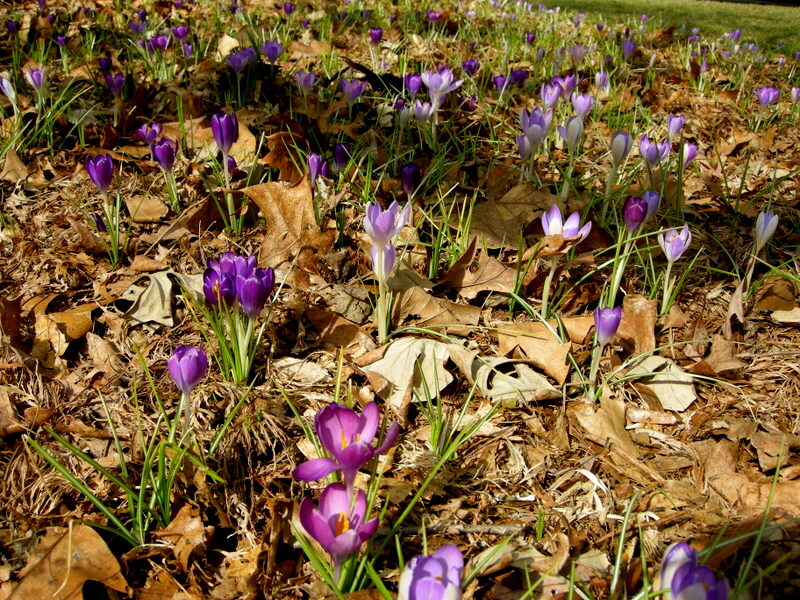 These are plants that come up in the spring to take advantage of the available sun before the leaves come out and then go dormant for the year as it gets hot. 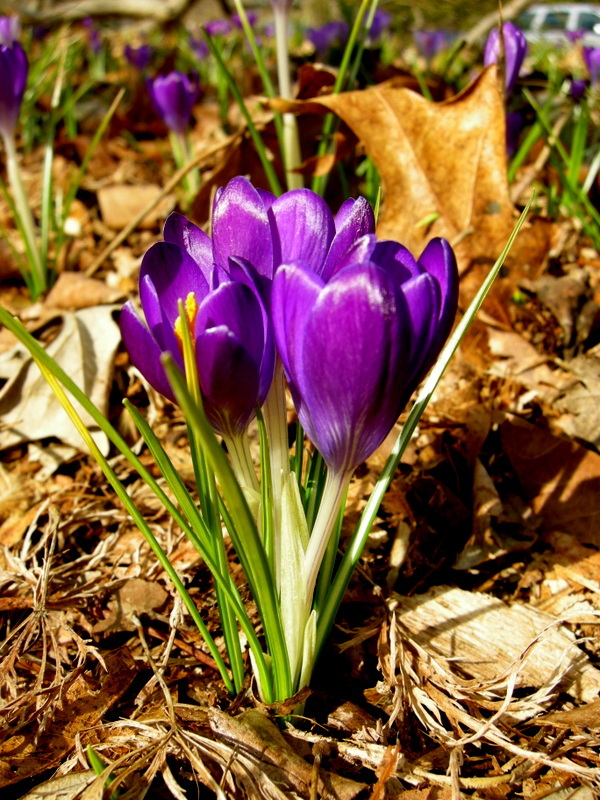 I especially appreciate their vibrant colors at a time of year when spring is here, but the weather is not necessarily warm and sunny. 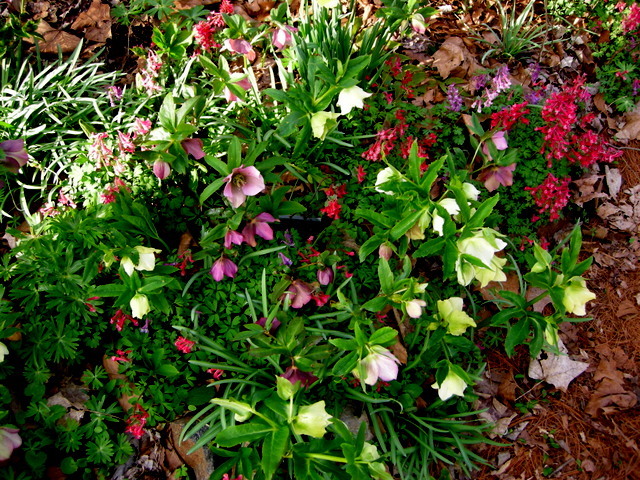 All the plants shown here are in bloom now or just about to bloom. 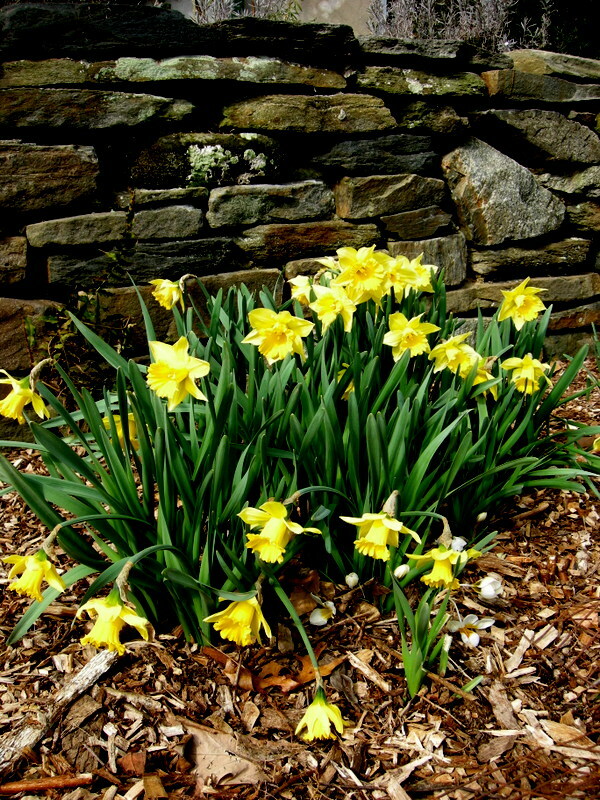 They are very easy to plant and grow. 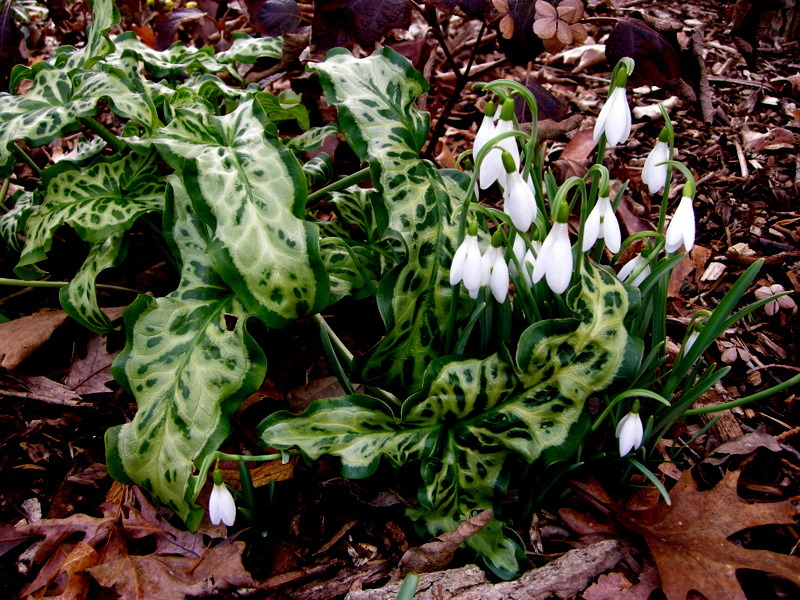 And best of all they spread by themselves to form large patches in the years after you plant them. 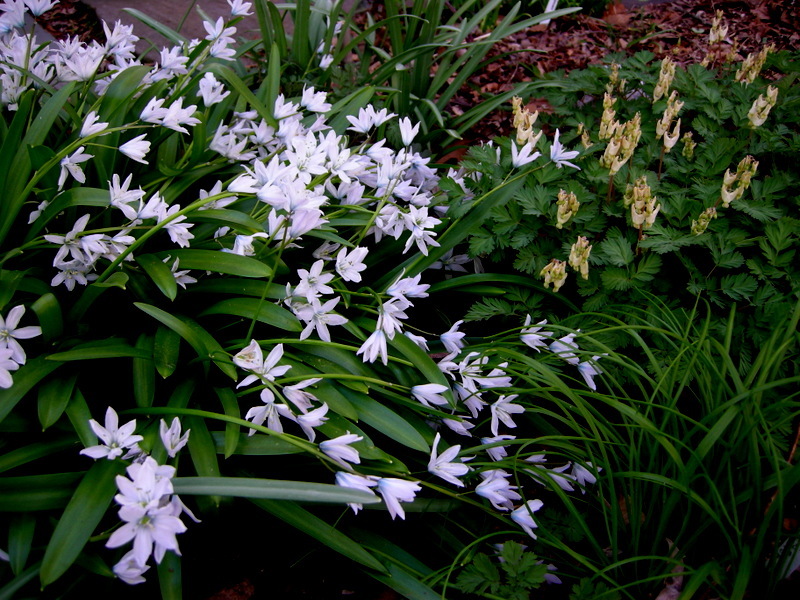 Spring ephemerals don’t take up any room as they can be interplanted with hostas, ferns, and other perennials that come up later and fill in the space. 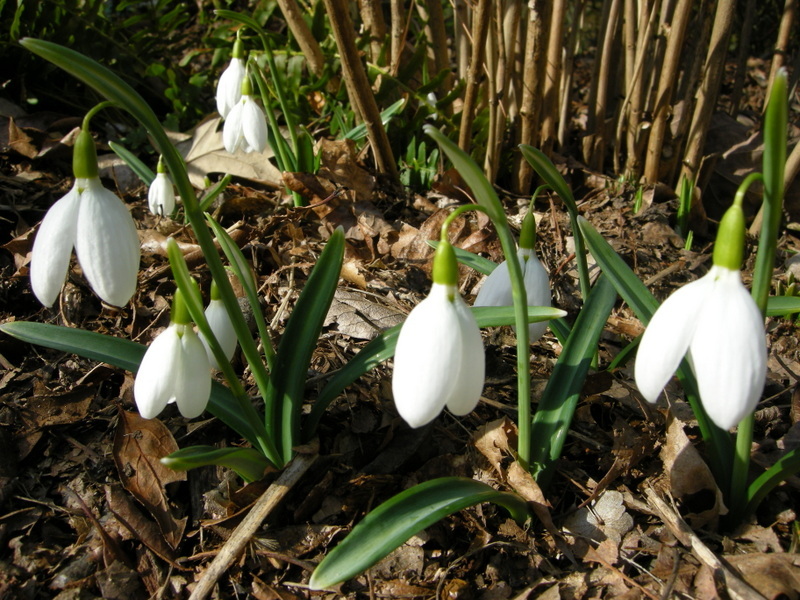 They are also great for the backs of beds that are empty and visible before other plants emerge. 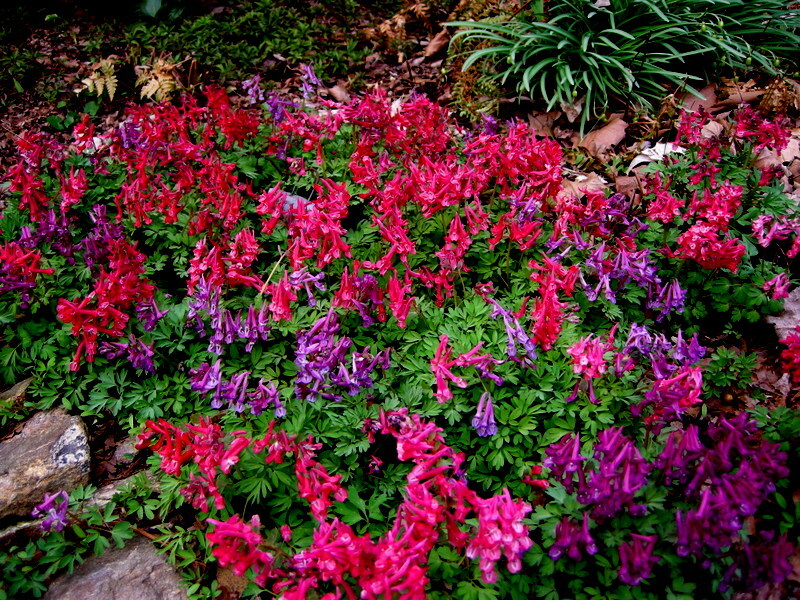 This riot of color is going on in my woods right now as various shades of Corydalis solida bloom with hellebores. 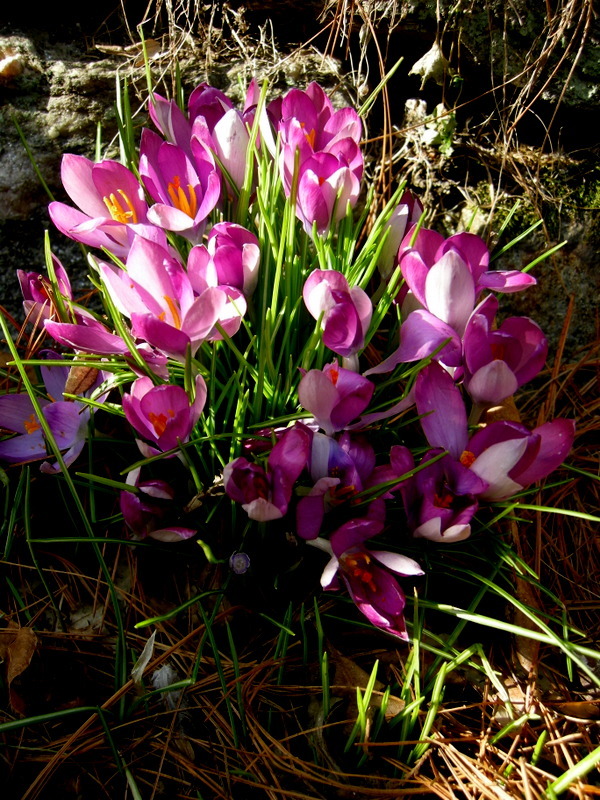 Snow crocus, C. tommasinianus, bloom with the snowdrops, and you can’t beat the color of ‘Ruby Giant’. 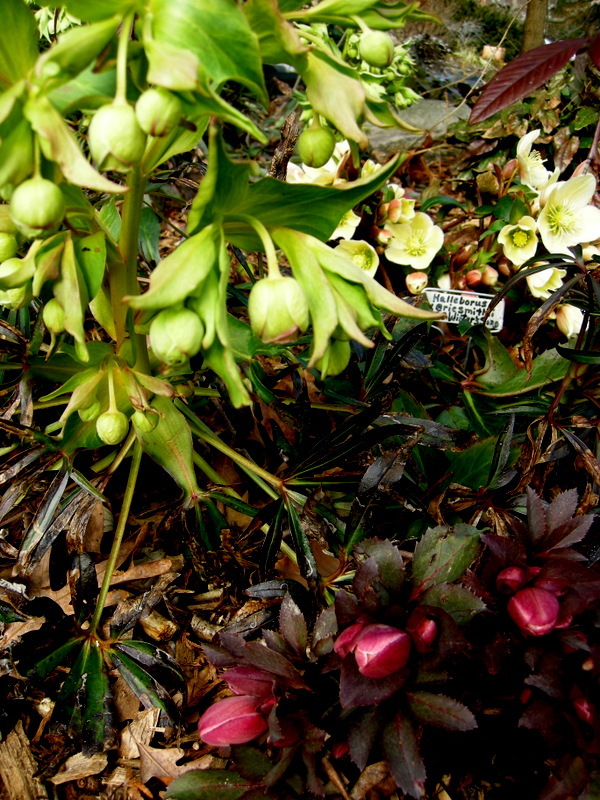 ‘Ruby Giant’ with white hellebores, a match made in heaven. 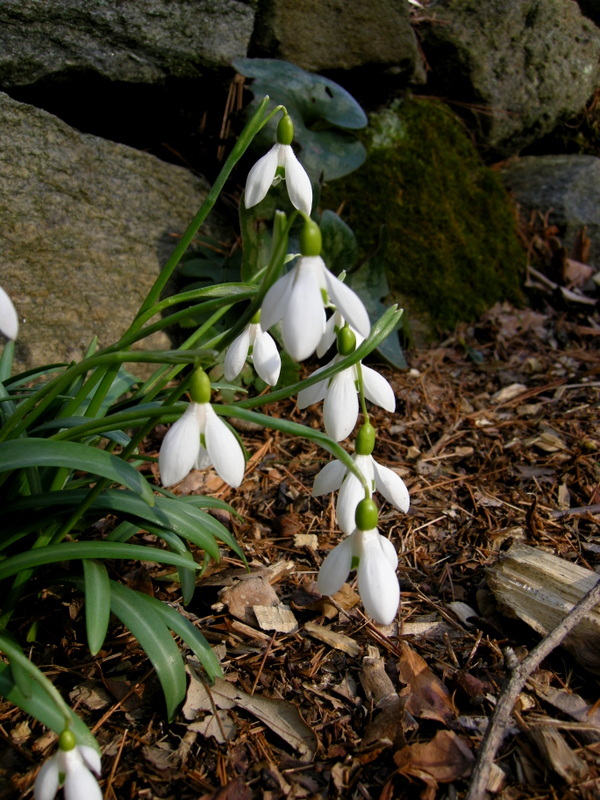 Pale blue squill, Scilla mischtschenkoana, is the earliest blooming of the group, here with Dutchman’s breeches. 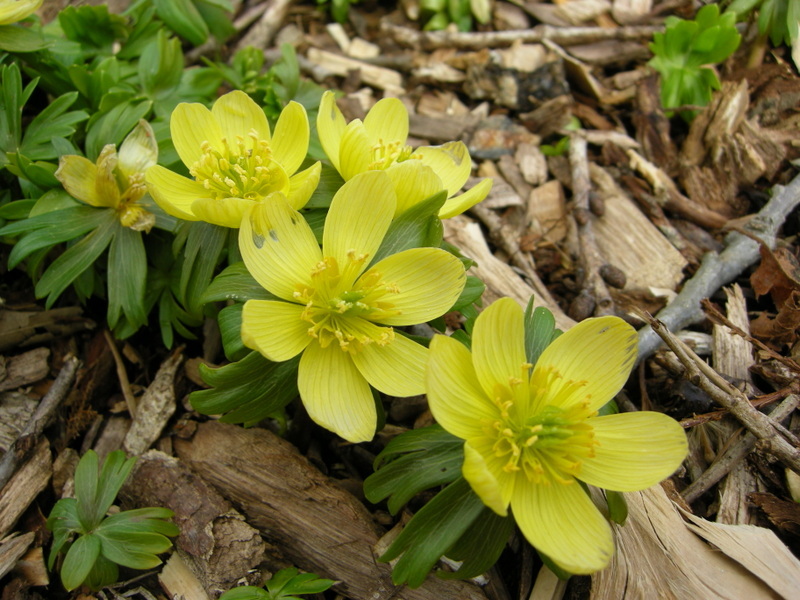 Winter aconite, Eranthis hyemalis, blooms with the snowdrops. 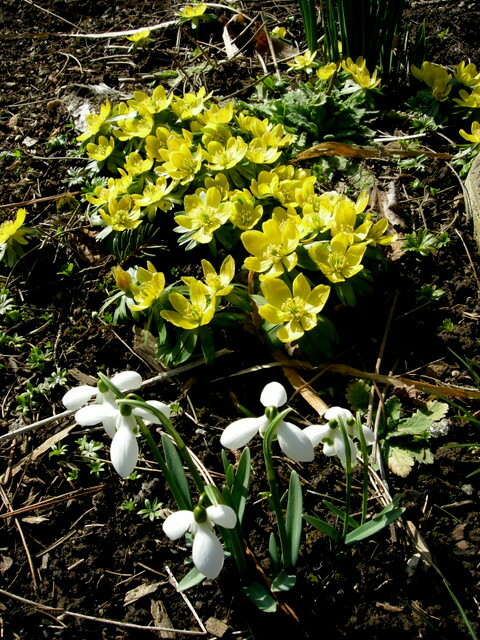 Snowdrops and winter aconite are the most beautiful sight in my late winter garden. 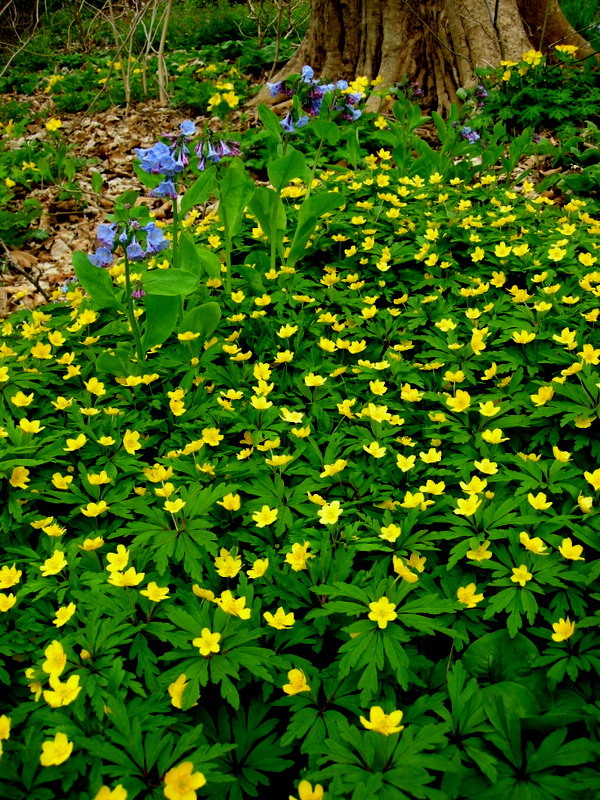 After it blooms, winter aconite’s elegant foliage makes a great backdrop for hellebores and Corydalis solida. 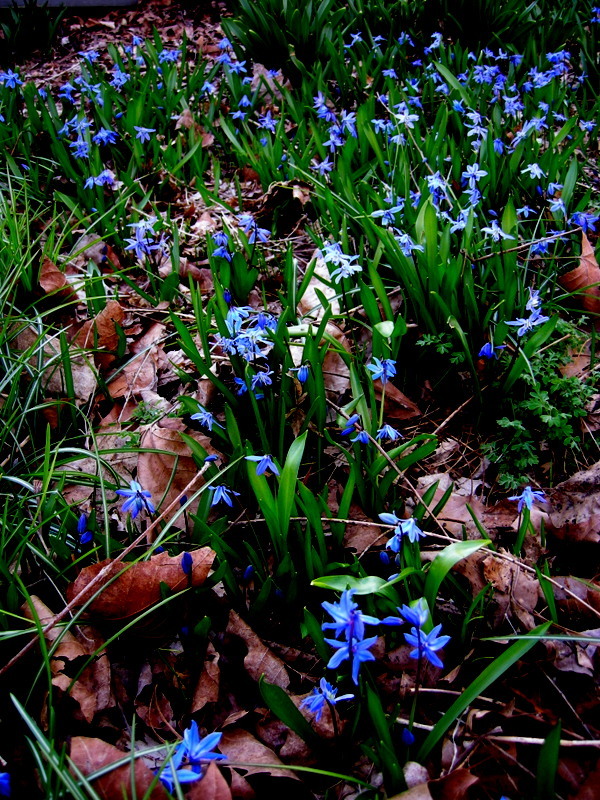 As the pale blue squill fades, striped-squill, Puschkinia scilloides, takes over. 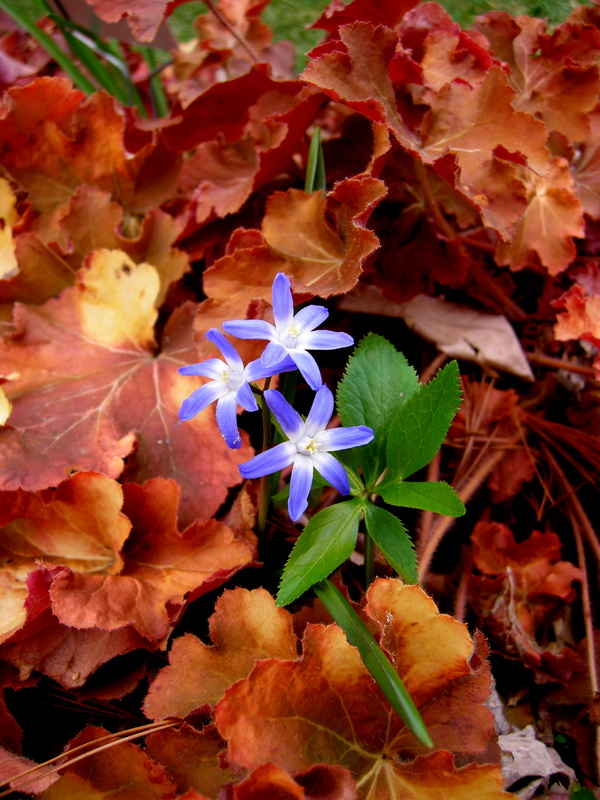 Striped-squill has naturalized to form a large patch under my winter hazel. 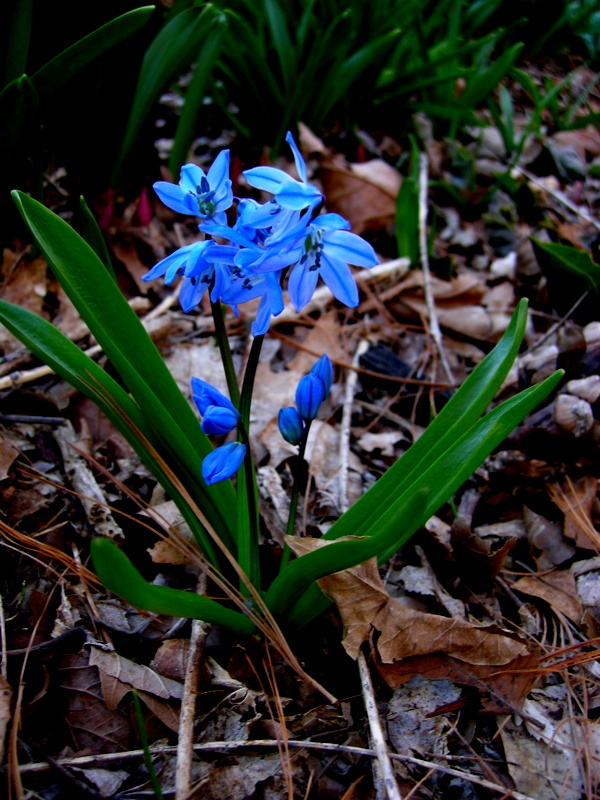 Also coming into bloom now are the fluorescent blue flowers of Siberian squill, Scilla siberica. 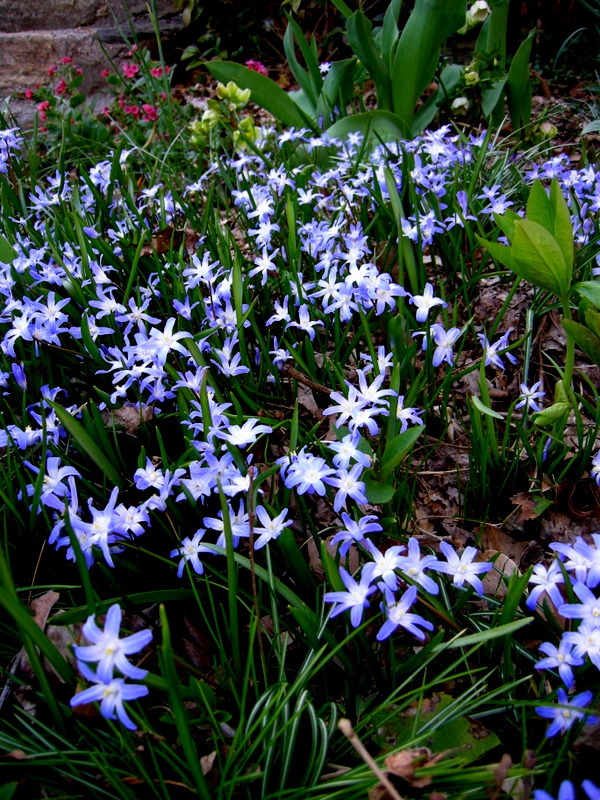 Siberian squill has moved all over my garden and has never appeared anywhere that I didn’t want it. 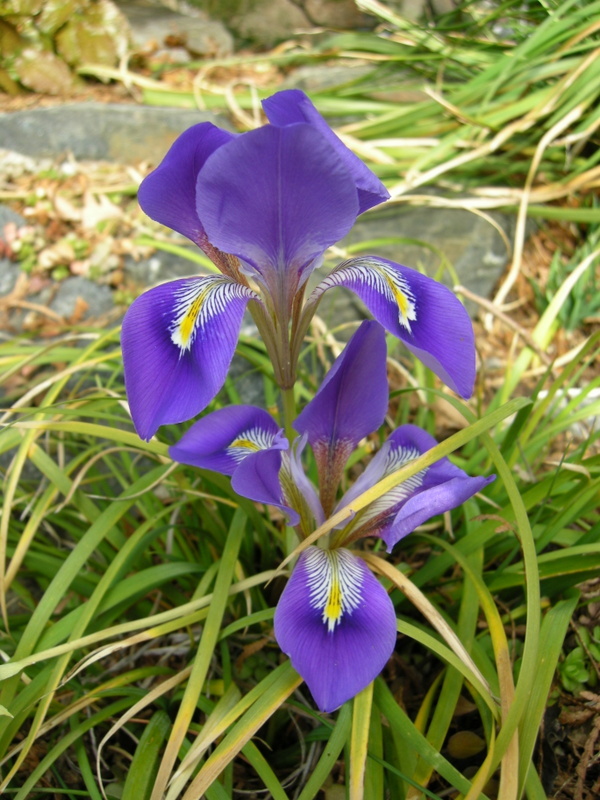 The color is just gorgeous. 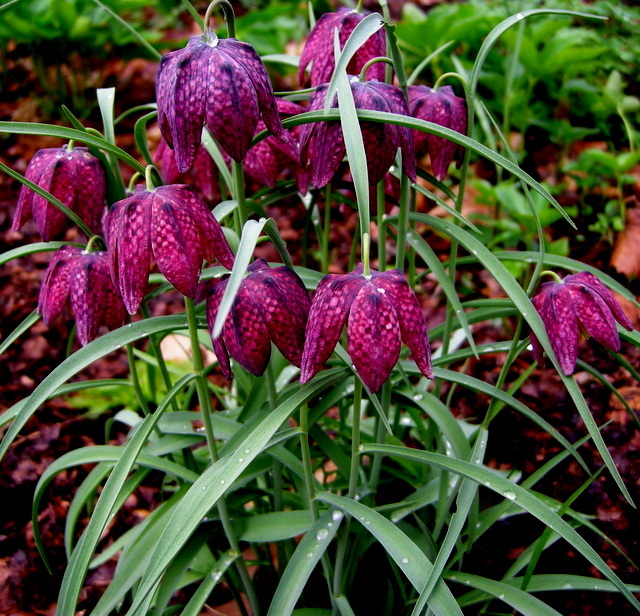 Checkered lily, Fritillaria meleagris, is just getting started. 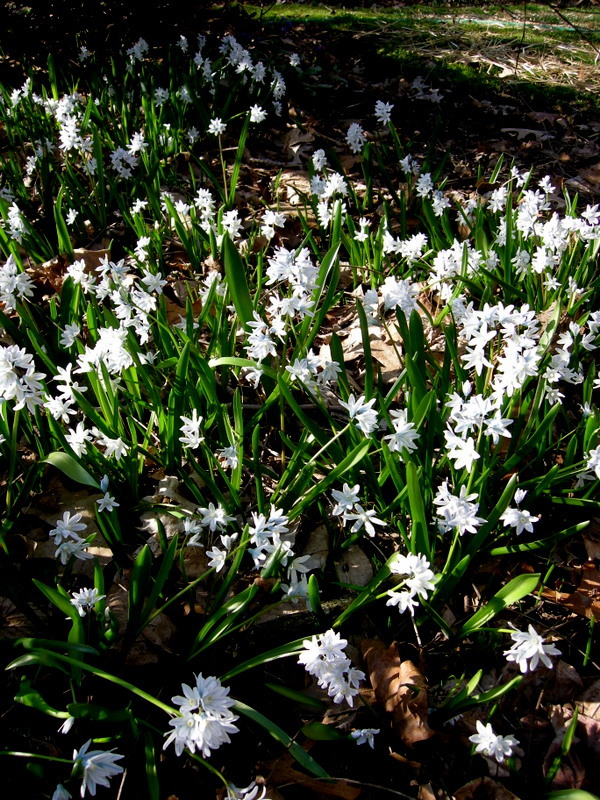 It too seeds to spread through out my woods. 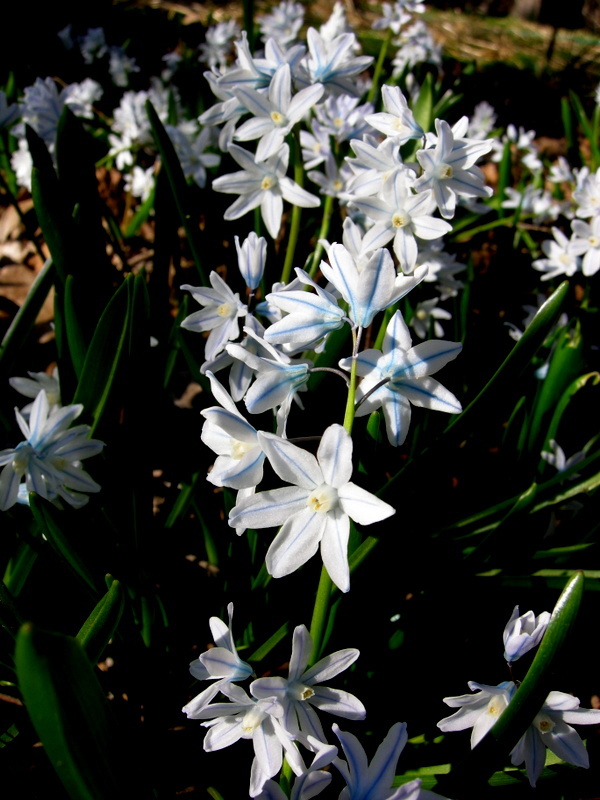 Glory-of-the-snow, Chionodoxa forbesii, has lovely upturned blue flowers with an ethereal white center. 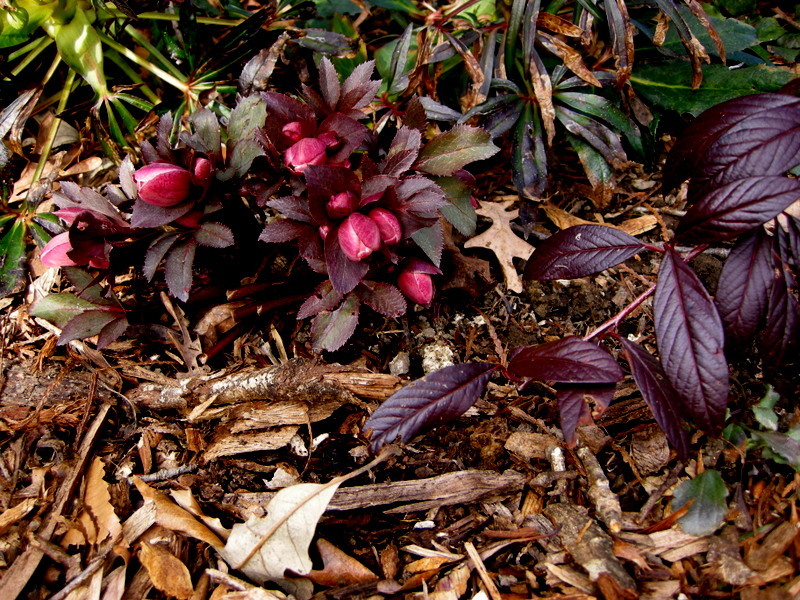 Here it peeks through the winter leaves of native ‘Caramel’ heuchera. 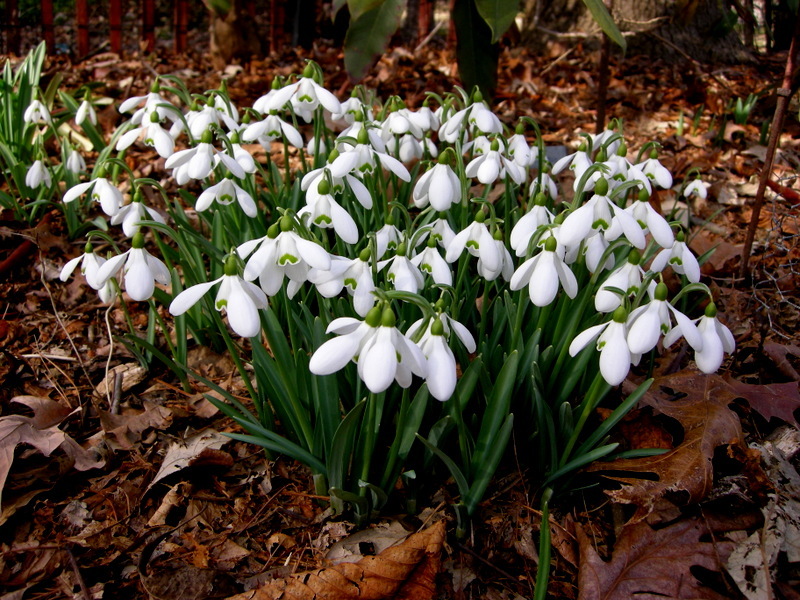 Glory-of-the-snow spreads quickly to form large patches. 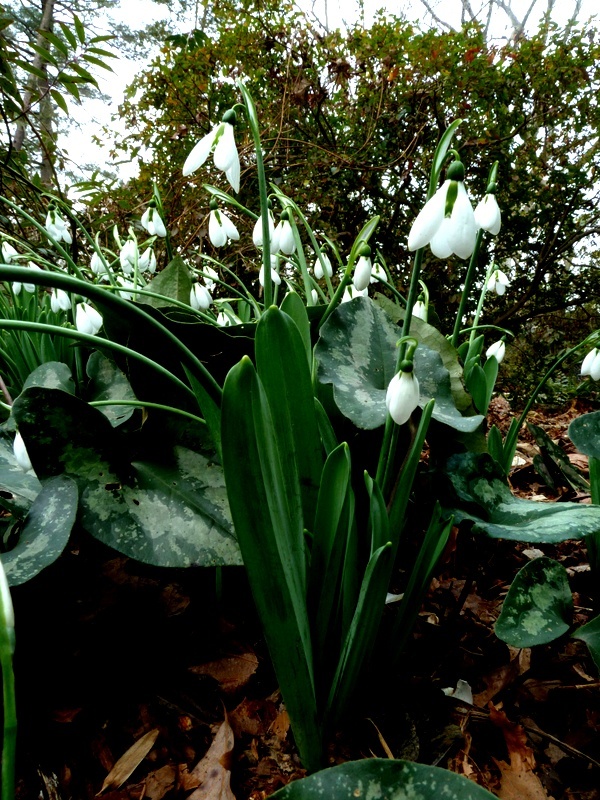 It looks especially beautiful under my star magnolia right now. 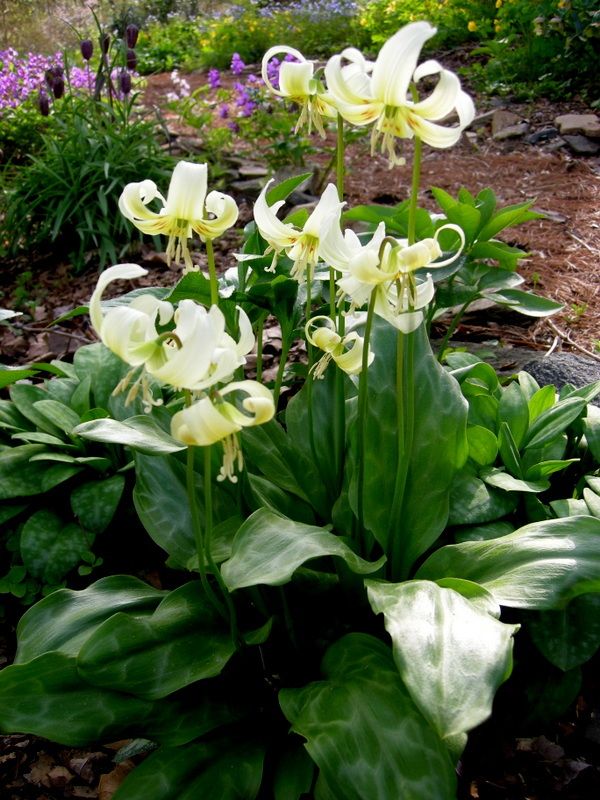 The lovely leaves of U.S. native dogtooth violets, Erythronium, are appearing now and the earliest varieties are blooming. 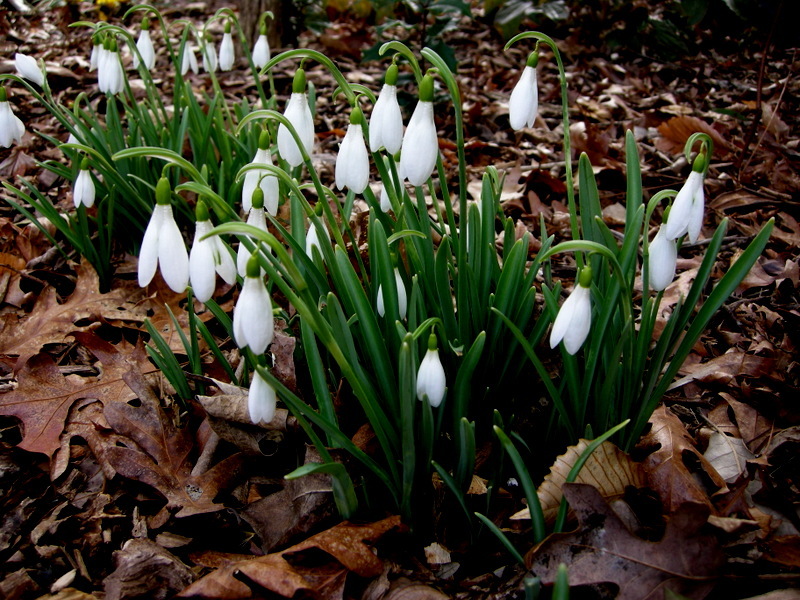 Although they look delicate, they are as tough as nails and come back in my woodland year after year. 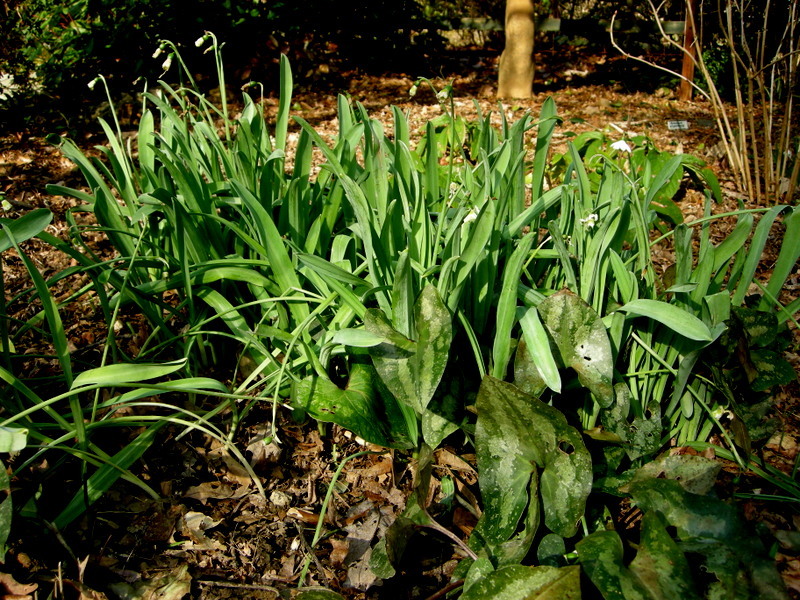 I can see the dark purple leaves of native Virginia bluebells, Mertensia virginica, emerging from the mulch. 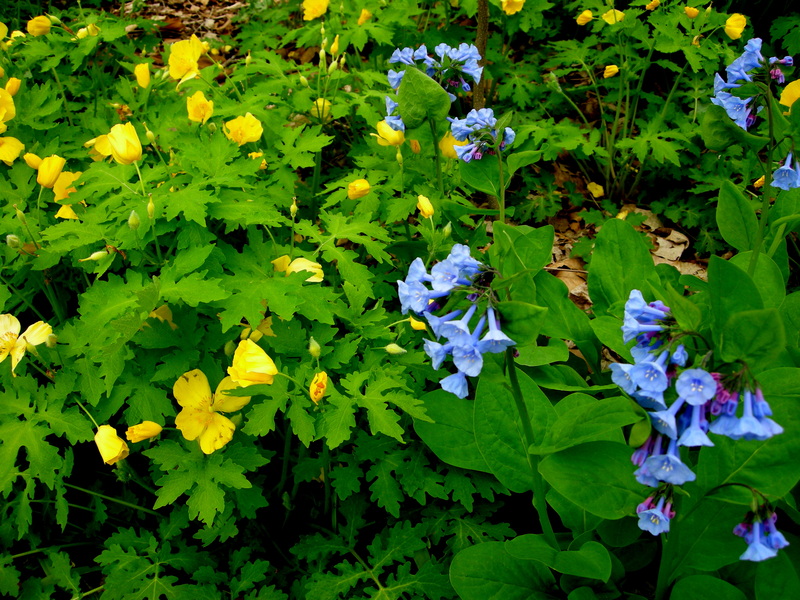 I can’t get enough of its porcelain blue flowers, here with native Celandine poppy. 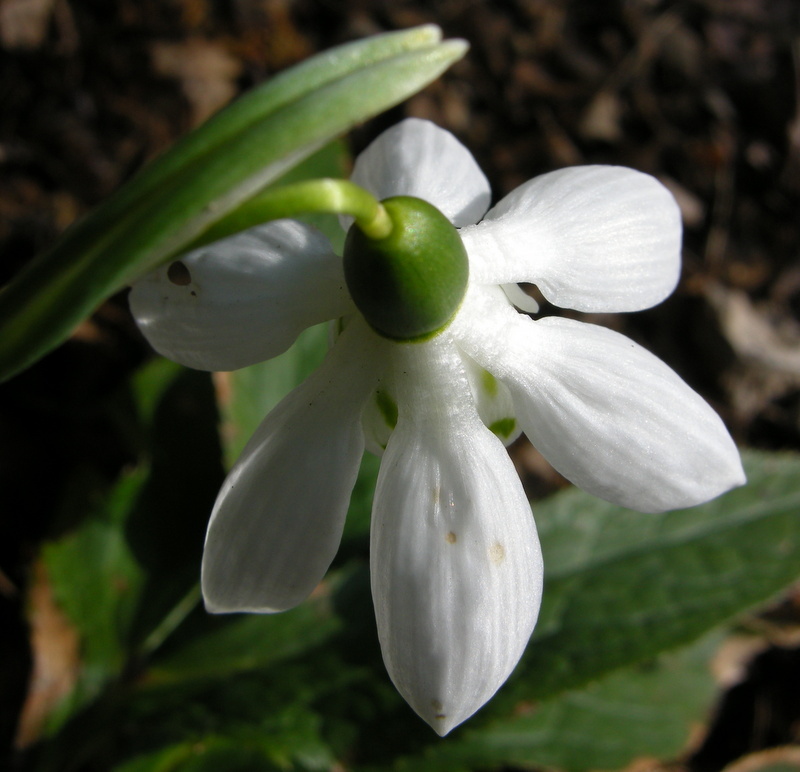 European wood anemones are also getting ready to pop. 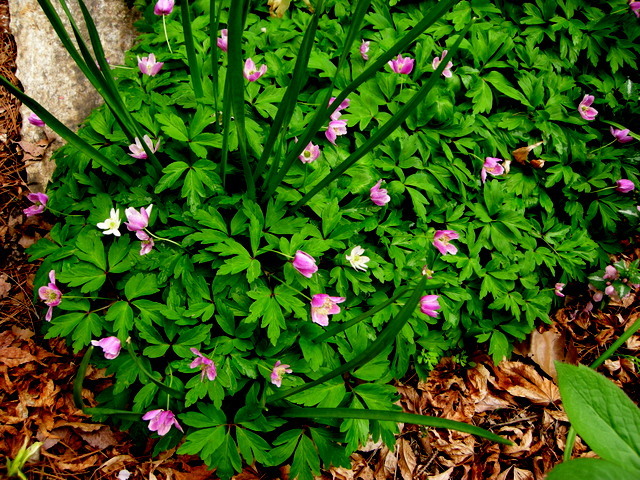 The earliest is yellow-flowered Anemone ranunculoides, but they also come in pink and white. 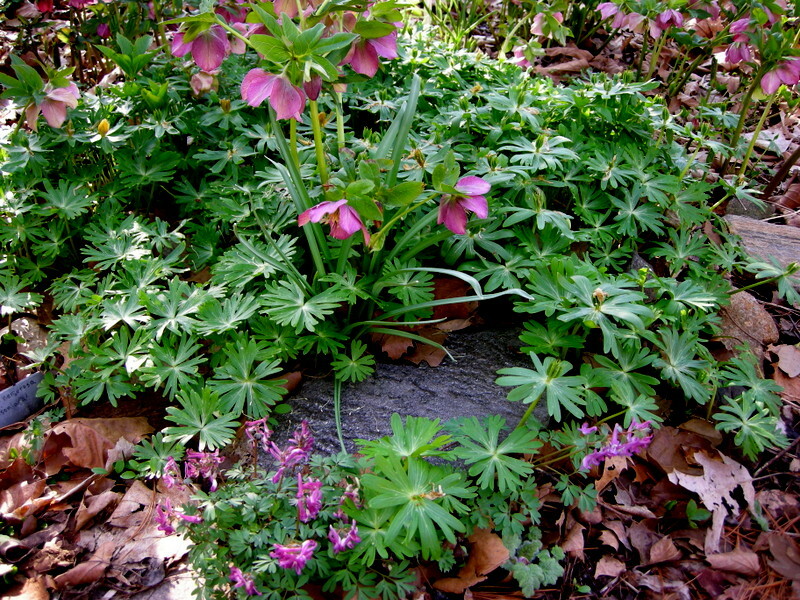 ‘Wyatt’s Pink’ European wood anemone is quite rare and beautiful. 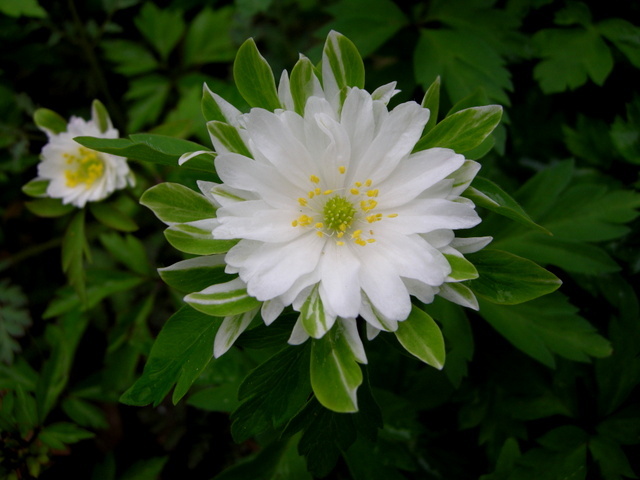 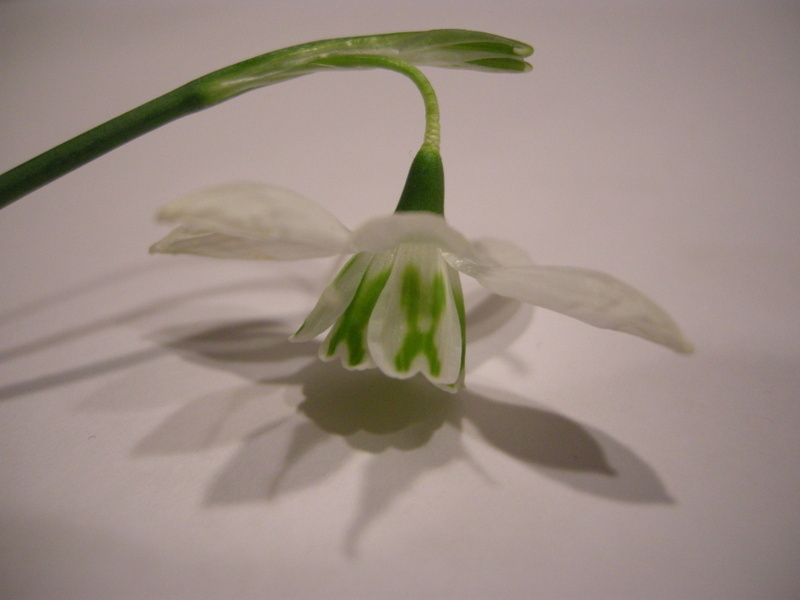 The elegant flower of ‘Bractiata’ European wood anemone. 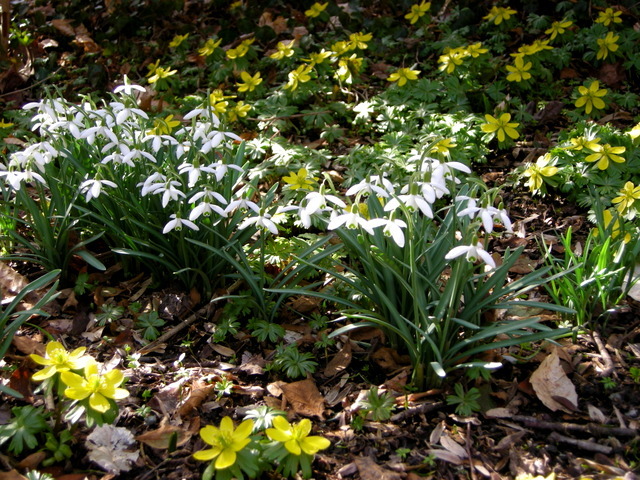 All these flowers keep me going through the cold wet days of early spring. 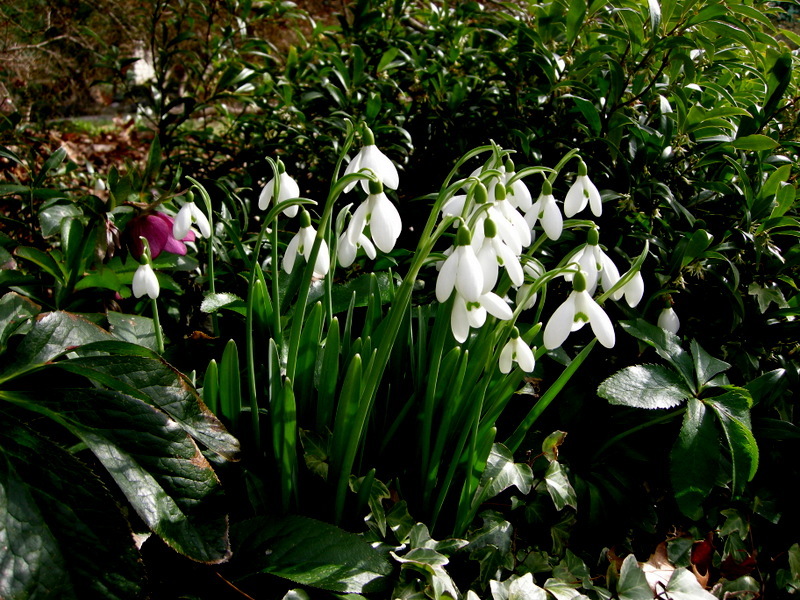 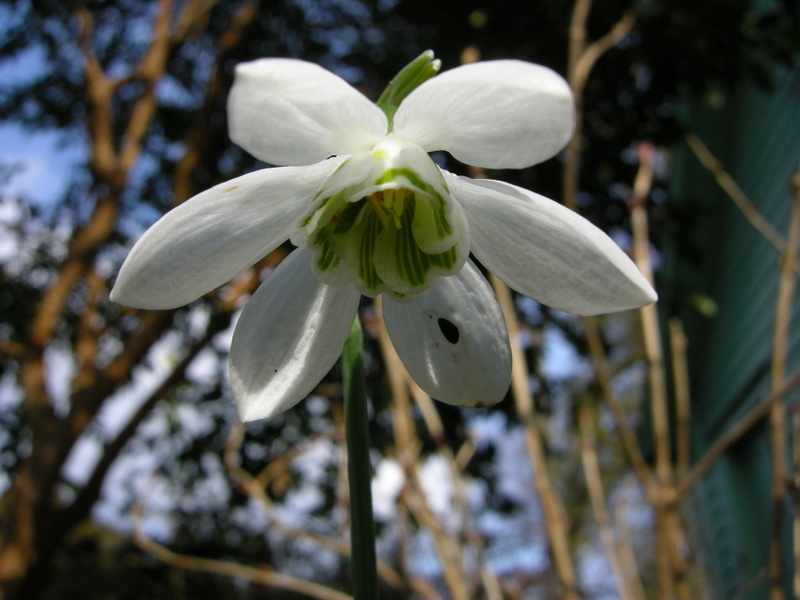 Add them to your own garden to beat the winter doldrums and signal that the end is in sight. 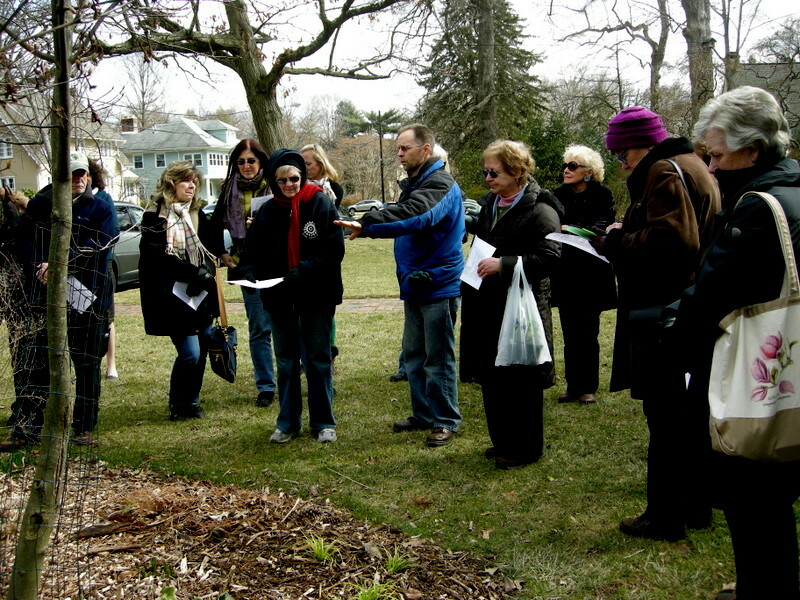 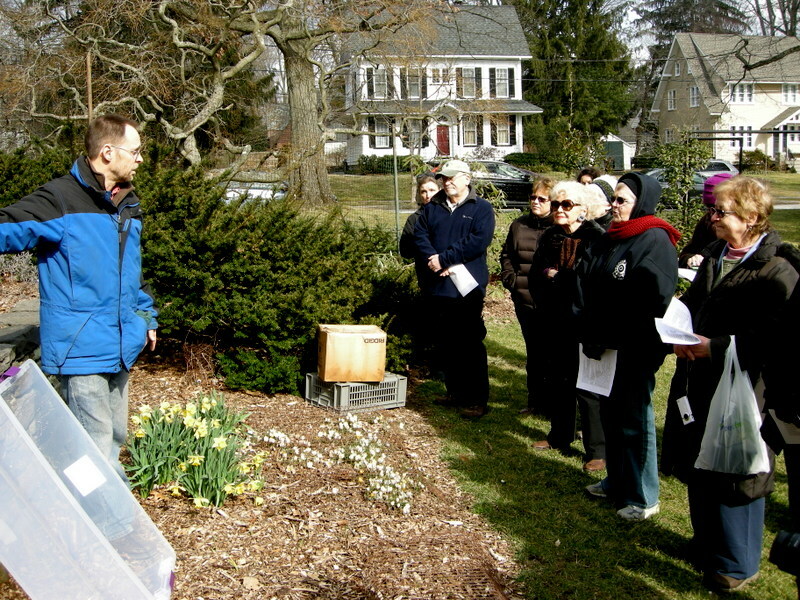 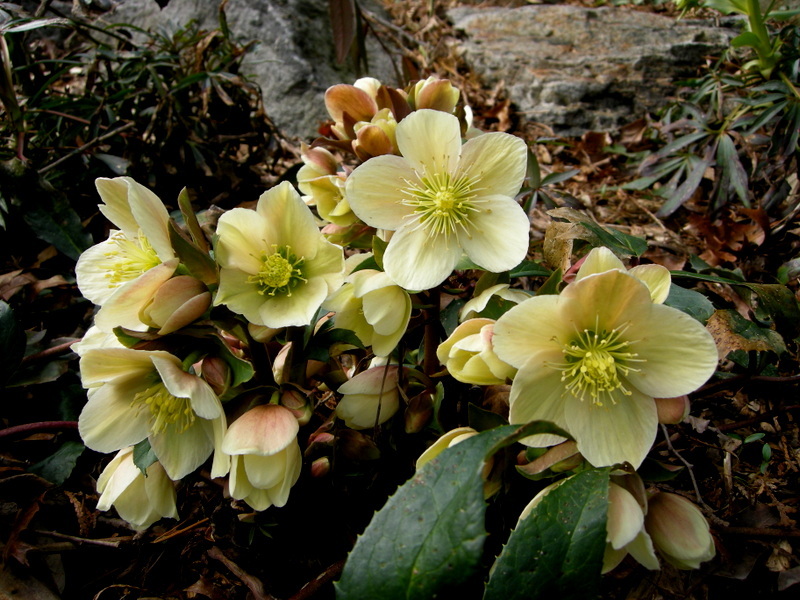 Nursery Happenings: Our first event is the Hellebore Extravaganza this Saturday, April 11, from 10 am to 3 pm. 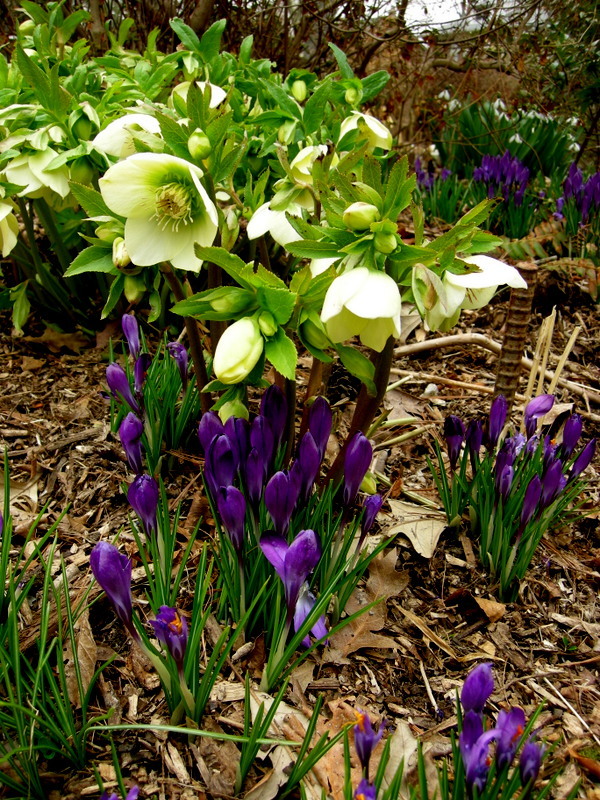 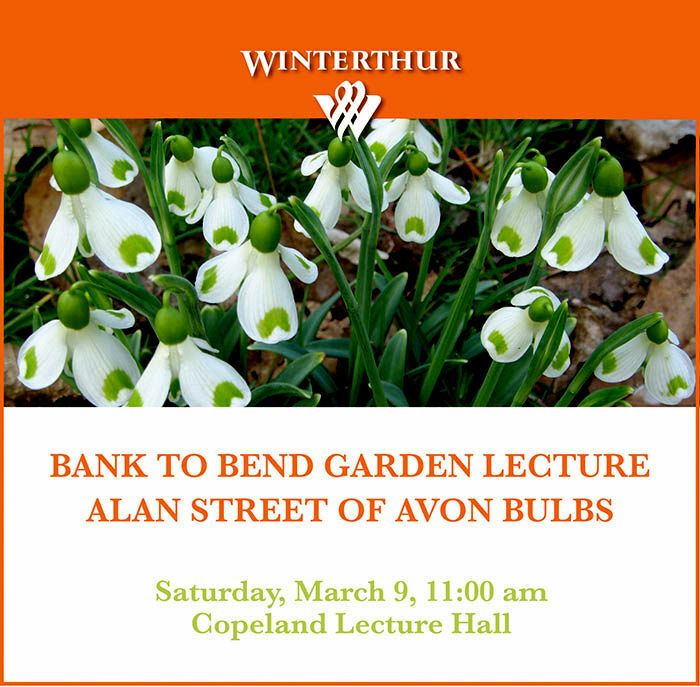 However, you can stop by anytime by appointment to purchase hellebores and other plants.